Now, it isn’t the worst spoiler in the world. He doesn’t kill Batman or flood Metropolis, but it’s still the last moment of a movie years in the making. So, what is it? 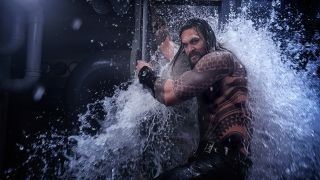 Speaking to Entertainment Weekly at San Diego Comic Con 2018 this past weekend (be sure to check out the Aquaman Comic Con trailer if you haven’t already), Momoa charts the journey Arthur Curry has been on – and caps it all off with a sneaky spoiler. That sure sounds like Aquaman is going to be crowned King of Atlantis in the final moments. I know, quelle surprise, what a shocker - the King becomes King. Jason Momoa isn’t exactly shying away from that reveal, either, especially as know it’s an origin story. But still: happy with that, DC fans? Before Aquaman pops up to spoil them, check out every new DC Extended Universe movie up until 2020.